Some analysts are warning that oil prices could reach $100 per barrel after the Iran sanctions are reimposed on November 4th. Oil prices have not been above $100 since 2014. Despite global oil production surpassing the 100 million b/d mark in August, there are problems ahead. Venezuela’s production for August was down to 1.22 million b/d and seems likely to go lower. Iranian exports continue to contract, and there is always trouble in Libya and Nigeria which could reduce their oil production by hundreds of thousands of barrels per day at any time. Even the ever-optimistic EIA is saying that the outlook for US shale oil production no longer looks as good as it did a few months ago. OPEC: August saw the cartel’s biggest month-on-month increase in more than two years, bringing the supply from the group’s 15 members to a nine-month high. The increase came from higher production in Libya, Iraq, Nigeria, and Saudi Arabia. OPEC’s increase far outweighed, at least for now, falling Iranian production. Global oil production in August climbed above 100 million b/d for the first time. Russia’s energy minister Alexander Novak says that OPEC, Russia, and their allies within the production cut alliance should sign an agreement on the group’s broader cooperation in December so that the new partnership format comes in force from January 1, 2019. A formal agreement between Russia and its allies in the former Soviet Union would bring about the most significant change to the OPEC cartel since its founding in 1960 by Iran, Iraq, Kuwait, Saudi Arabia, and Venezuela. Despite its massive oil exports, Moscow has long feared to join the organization for fear that its energy policies could be affected by votes or compromises inside OPEC. The success of the OPEC+ production freeze during the last two years has brought about a change in thinking for it resulted in a doubling of oil prices and saved some major oil exporters from near-bankruptcy. The addition of circa 15 million b/d to OPEC’s 32 million b/d allows the combined organization to have more impact on the oil markets in the years ahead. This union could become important if the Sino-American trade war results in a significant drop in the demand for oil. Despite the euphoria over OPEC’s production successes in August, there are still many dangers for the cartel’s production ahead. The 15-member OPEC has not increased its production significantly in the last 15 years and, except for a few bright spots, most of its oil fields are in decline. Several major OPEC oil exporters such as Venezuela, Nigeria, Libya, Iraq, and Iran, are involved in domestic or international situations which could reduce their exports in the next year or two. US Shale Oil Production: US crude oil production in 2019 is expected to grow at a slower rate than previously forecast, according to a monthly EIA forecast released last week. 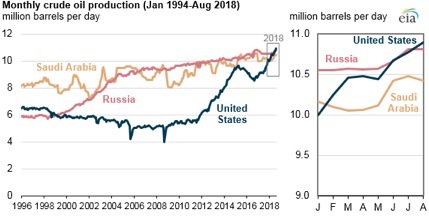 US crude production now is expected to rise by 840,000 b/d to 11.5 million next year, lower than a previous estimate for it to grow 1.02 million b/d to 11.7 million. Oil demand growth in 2019 is expected to rise by 250,000 b/d, a decrease from EIA’s previous projection for an increase of 290,000 b/d. The agency left 2018 production and demand growth forecasts unchanged. Behind this change is the recognition that drilling activity in the Permian basin has begun showing signs of a slowdown due to limited pipeline takeaway capacity and decreasing well productivity. Although numerous challenges are facing producers in the Permian Basin, interest remains high. The price rights to drill on the New Mexico side of the Permian Basin soared to $95,001 an acre in a recent federal government auction, a record high for land in the Permian. The state’s previous record was $40,001 an acre set in December, according to a statement yesterday by the US Department of the Interior. The two-day auction saw bids on 142 parcels of land and raised $972 million, more than the whole of 2017 and double the 2008 record. Iran: The prospects for Iranian oil exports after US sanctions are imposed remained the top oil market story last week. Iranian crude production fell 200,000 b/d from July to 3.52 million b/d in August as hedging activity indicates some traders are preparing for a price spike above $80 a barrel as a result of further declines in Tehran’s exports. S&P Global Platts Analytics expects 1.44 million b/d of Iranian crude and condensate to leave the market when the US secondary sanctions snap back November 5, compared with April levels. The EIA says Iran’s production already has dropped 310,000 b/d since April. Tehran’s problems could increase as it meets obstacles in selling its condensate and refined products. Iran is dependent on exports of condensates and fuel oil, while it relies on gasoil and gasoline imports. Unlike when the US imposed sanctions in 2011, the Trump administration has broadened the list of secondary sanctions, to include condensates and other oil products “obtained from the processing of crude oil (including lease condensate), natural gas, and other hydrocarbon compounds.” There have been signs Iran’s exports of fuel oil and LPG have started to fall in the past few weeks. Iran has started to store oil in its own tankers off its coasts ahead of the US sanctions. According to tanker tracking data, at least five tankers owned by the National Iranian Tanker Company have been sitting fully laden with crude oil off the Kharg Island oil terminal in the Persian Gulf over the past two and a half weeks. Another two tankers full of Iranian condensate, the ultra-light oil Iran produces from its natural gas fields, have been anchored off Dubai for weeks. While Russia, China, and Turkey remain firm in their commitment to Tehran, there are reports that other countries such as Japan, India, and South Korea are giving in to Washington’s pressure and are reducing their purchases of Iran’s oil. Last week the issue of whether the sanctions will result in a substantial increase in oil prices came back into the news. During an interview in Moscow last week, US Energy Secretary Perry said last week that Saudi Arabia, the United States, and Russia could between them raise global output in the next 18 months to compensate for falling oil supplies from Iran and elsewhere. Countering this view was Iran’s OPEC governor Hossein Kazempour Ardebili who told Reuters that there is already an emerging “supply shortage” and little spare capacity virtually everywhere means that the US can’t achieve its goal of bringing Iranian oil exports down to zero. Iraq: Baghdad’s oil production grew steeply again in August, as the federal government continued to unlock field capacity in the wake of loosening OPEC constraints. Combined output from the federal government and the autonomous Kurdistan Regional Government (KRG) hit 4.81 million b/d. Iraq replaced Saudi Arabia in August as the top oil supplier to India as refiners turned to Iraq to compensate for a lower import of Iranian oil. Gulf Keystone Petroleum said it would resume investing in the Shaikan oil field in Iraq’s Kurdistan Region, aiming to boost production to 55,000 b/d in the second half of 2019, from just over 30,000 b/d now. The political and social situations, however, are not going so well. Demonstrations flared in Basra this month after thousands fell ill because the water supply was contaminated and intensified last week after several protesters were killed. Protesters burned the offices of most political parties in Basra, including Iran-backed paramilitary groups. Prime minister Haider Al-Abadi is facing growing domestic discontent as veiled criticism from the country’s top Shia cleric, and violent street protests threaten his attempts to form a new government. The strife is undermining hopes that elections held in May would mark a turning point and set Iraq on the road to recovery after decades of conflict. In a rare intervention, the office of Ayatollah al-Sistani, Iraq’s top Shia cleric, issued a statement urging politicians in power not to run again, a move interpreted as a call for Mr. Abadi to abandon his efforts to remain prime minister. Islamic State militants have bombed an oil pipeline in Kirkuk, northern Iraq. It was not immediately clear which pipeline the Islamic State militants had blown up and what the effect on shipments from northern Iraqi fields will be. The Baiji refinery, which was shut down in 2014 during the war with Islamic State, has partially resumed operations. The 70,000 b/d Salahaddin-2 unit of the refinery is operating at full capacity as of last week. Libya: Several armed men attacked the headquarters of Libya’s National Oil Corporation in Tripoli last week, killing at least two staff members. In the first attack of its kind against the top managers of Libya’s state oil industry, two of the gunmen were killed and at least 10 NOC staff wounded, officials said. Security forces said they had regained control of the building in the center of the city. The attack came less than a week after a fragile truce halted fierce clashes between rival armed groups in Tripoli which has been in turmoil since a 2011 uprising. The US Treasury Department, along with the United Nations, placed sanctions on Libyan militia strongman Ibrahim Jadhran over the June attacks on the country’s oil ports. The sanctions were proposed by Libya’s Permanent Mission to the UN. Ibrahim Jadhran, former leader of Tripoli-backed Petroleum Facilities Guard (PFG), now finds himself on the wrong end of both the United Nations and the United States. Worries about the Chinese economy continue with Investment in factories, railways, and other projects in China so far this year growing at its slowest pace in more than a quarter-century. Fixed-asset investment outside rural households rose 5.3 percent in the January-August period from a year earlier, the National Bureau of Statistics said Friday. The rate was the most sluggish since 1992 when the investment data was first available. China is the centerpiece of what a growing number of financial analysts warn could be another global economic recession. Bank of England Governor Mark Carney recently said that China is “one of the bigger risks” to global financial stability. Since 2007, China’s debts have quadrupled. According to the IMF, its total debt is now about 234 percent of gross GDP, which could rise to 300 percent by 2022. The significance of China’s dwindling supplies of cheap domestic energy is little understood by mainstream economists. Beijing is considering allowing its northern provinces to decide on individual output cuts by heavy industry to rein in emissions during the winter. Talk of the move drove down steel and industrial raw material prices and comes as Beijing looks to end its “one-size-fits-all” fight on pollution to limit economic disruptions. “Production cuts on heavy industry will remain this winter, but detailed cutting rates will be set by local authorities based on their own situation,” said a knowledgeable Chinese source. PetroChina has just signed a deal to buy 3.4 million tons of LNG per year for 20 years from QatarGas. This is China’s largest ever LNG supply deal. State-controlled QatarGas has agreed to supply PetroChina from the QatarGas 2 project, a joint venture between Qatar Petroleum, Exxon Mobil and France’s Total. The first cargo will be delivered later this month. The deal comes as President Trump ramps up the ongoing trade war between the US and China. Trump says he is ready to levy additional taxes on practically all Chinese imports, threatening duties on $267 billion of goods over and above planned tariffs on $200 billions of Chinese products. If China’s retaliation includes a 25 percent duty on US LNG, it would no longer be competitive for Chinese importers. On Friday, Russia’s central bank raised the key rate from 7.25 percent to 7.5 percent per annum. According to the bank’s statement, the annual inflation is forecast to be 5-5.5 percent in 2019 and to return to 4 percent in 2020. After a week in which the ruble fell to a two-year low against the dollar, investors anxious about emerging market turmoil have been concerned about what the bank would do. The Kremlin has been putting the bank under unprecedented pressure to cut the benchmark rate — which stands at 7.25 percent — to help stimulate growth to pay for President Vladimir Putin’s ambitious spending targets. The General Court of the European Union upheld sanctions imposed on several Russian oil companies and banks after the annexation of Crimea in 2014 and Russia’s involvement in the Ukraine crisis. Russia’s largest independent gas producer, Novatek, surpassed in market value state behemoth Gazprom for the first time. Strange as this may seem to casual observers of the Russian gas market, Novatek’s value has been rising consistently over the last years while Gazprom’s has stagnated. The most apparent difference between the two is ownership. Gazprom is majority owned by the Russian state. Government ownership means Gazprom caters more to the government’s political interests rather than the interests of its minority shareholders. It also means the company undertakes projects with uncertain returns as a state company while private shareholders like certain returns. The government has agreed to hand over at least seven oil fields to little-known companies that will be paid to boost output through contracts similar to ones killed off during the Hugo Chavez period. The new plan signals that President Maduro, who is struggling under a hyper-inflationary economic meltdown and fast-declining oil output, is willing to reverse the efforts of his predecessor to expand the state’s role in the energy industry. However, the plan faces significant hurdles because the companies involved have no known experience operating oilfields, and US sanctions would inhibit more experienced firms from getting involved. Venezuela’s production fell in August by 20,000 b/d to 1.22 million b/d. Compared to August last year, Venezuelan oil production is down by 680,000 b/d. During a rare visit by President Maduro to Beijing, China agreed to several small oil deals with Venezuela last week but gave no public confirmation that it would extend more loans to the country. Venezuela faces a stiff payment schedule over the next two months of about $2 billion to bondholders, some of whom have debt secured against US-based refiner Citgo, and in compensation to western oil companies for past nationalizations in Venezuela. Simon Zerpa, Venezuelan finance minister, said earlier this week that Beijing would extend a $5 billion loan to Caracas. But Premier Li Keqiang, while saying that China would help Venezuela, made no mention of a loan of that size. China lent the country more than $50 billion over the past 10 years, mostly backed by oil deliveries that are no longer being made. The largest loan, from the China Development Bank in 2010, was worth more than $20 billion. Terms of China’s loans are not made public. Venezuela resumed supplying a critical domestic crude to political ally Cuba this summer as its refining output fell further. The shipments, which began in June and continued through August, totaled 4.19 million barrels of Venezuela’s Mesa 30 crude, a type used to produce fuel at domestic refineries and to blend with heavier oil for export. Venezuela has supplied Cuba with oil under agreements since 2000. Havana has been deeply involved in providing advice and assistance to Caracas’s intelligence and security services. As Venezuela’s domestic situation deteriorates, Cuban security assistance may be a priority for the embattled President who may be vulnerable to a coup or uprising.